It is now less than two weeks until the next instalment of the Fitzpatrick Cup, this year to be played in Cork and hosted by the UCC Bombers. The www.afleurope.org website has the following comprehensive write up of the event. The 2017 AFL Europe calendar kicks off with a bang on Saturday 4th of February with the 4th edition of the Fitzpatrick Cup being hosted by University College Cork (UCC). The ‘Fitz’ is a relatively new addition to the AFL Europe schedule with it first being run in 2013 to tie in with the International Rules Series held in Dublin between Australia and Ireland. Four teams took to the field that day with Oxford, Dublin City University (DCU), UCC and Magherfelt College competing in the inaugural competition. The Chairman of the AFL Commission, Mike Fitzpatrick, was in Dublin for the event and attended the tournament named after him. Since then the competition has boomed with each tournament growing stronger and stronger. The following year saw five teams compete in Birmingham, with six facing off the year after that. 2016 saw further growth with the introduction of the women’s competition enhancing the tournament profile. 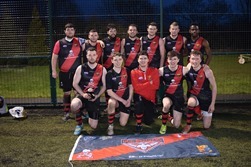 This year sees the competition move to Cork, Ireland, and has eight men’s and three women’s teams pulling on the boots and competing to become the Intervarsity Champions of Europe. Head organiser, Eoin O’Sullivan, along with the rest of the UCC organising committee have worked tirelessly putting together this year’s premier universities competition and are expecting it to be the biggest and most successful tournament yet. In the men’s competition, it’ll be the University of Birmingham who’ll be looking to claim their third straight ‘Fitz’. They’ll be coming up against home side and runners up from 2016, the UCC Bombers, who’ll be looking to impress and go one better in front of a home crowd. For the women, it’ll be a very close field with UCC, Maynooth and Oxford locked in to compete in the women’s second instalment of the competition. It’ll be the home-side, UCC, who’ll have the home crowd advantage and could prove the clincher in tight games. 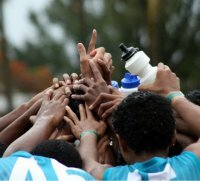 The 2017 ‘Fitz’ is shaping up to a the biggest and best yet with the standard of football from the youthful university students sky rocketing each year. Be sure to stay tuned into the AFL Europe website and social media for more details and previews over the next month.